The most important problems the energy sector faces in Macedonia are an unfavourable energy mix with a high prevalence of lignite, a strong dependence on energy import, poor condition of the energy system and inefficiency in energy production and use. This paper investigates the prospects for realization of the 100% renewable energy system in Macedonia by making use of the EnergyPLAN model. 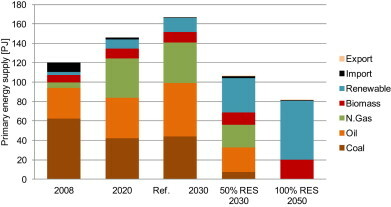 Analysis was conducted for two renewable scenarios designed for the years 2030 and 2050. First scenario, the 50% renewable energy system, has been created for the year 2030 and represents the first step towards the 100% renewable energy future of Macedonia. The second scenario has been designed for the 100% renewable energy system based only on the renewable energy sources (RES) in the year 2050. Special attention in the design of these systems has been given to intermittent RES and to storage technologies. The analysis reveals that at the moment the 50% renewable energy system seems much more likely than the 100% renewable energy system, but with additional energy efficiency measures, which will lead to a decrease of consumption and with installation of new generation capacities this goal can be easily achieved.